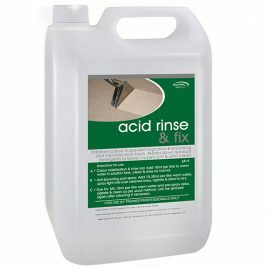 A fibre and fabric acidic rinse. 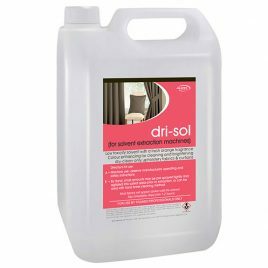 Apply during or after the cleaning operation to carpets or upholstery fabrics which are non colourfast or likely to give rise to browning problems. 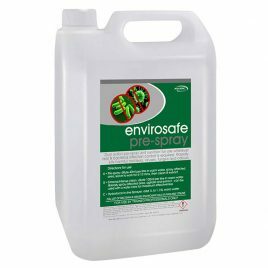 Works by neutralising any alkaline pre-sprays or detergents used which, if left in the fibres, may cause colour migration, resoiling, etc. 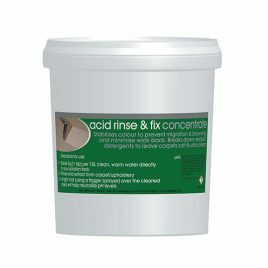 Works the same as the Acid Rinse but in powder concentrate form. 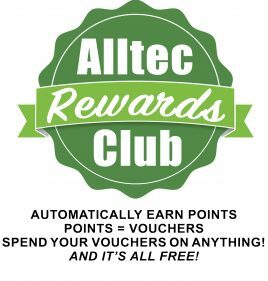 Acidic Cleaner is used for man-made ceramic, porcelain and quarry tile. 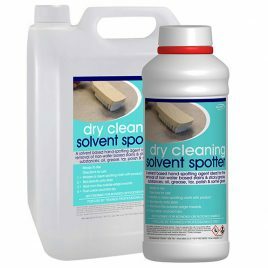 A handy aerosol solvent based spot remover, similar to Dry Cleaning Solvent. 100% safe on all fabrics and carpet fibres (except bitumen backed carpet tiles etc). 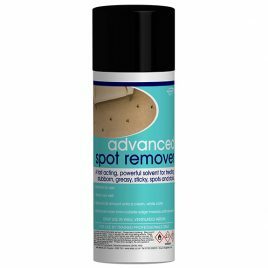 Excellent for removing spots and marks, oil, grease, tar, polish and some glues in smaller areas. 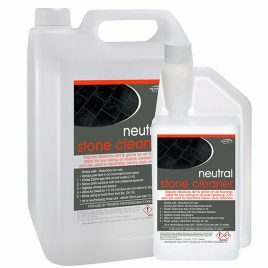 This highly active blend of cleaning surfactants is formulated to rapidly dissolve dirt and grease build up from Ceramic tiles, grout and natural stone. 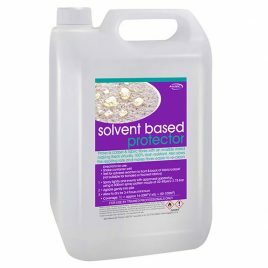 Solvent Carpet & Upholstery protector. 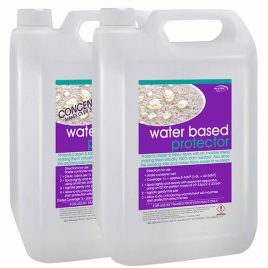 Flourochemical resin in a spirit base (CFC free), for safe application to fibres for protection from both water and oil based stains, also retards the re-soiling and wear rate. Works by protecting each and every fibre with an invisible shield making them virtually 100% stain resistant. 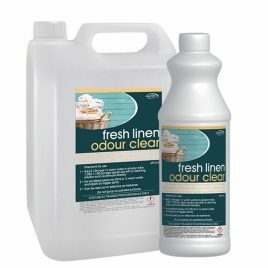 Suitable to protect most types of fabrics including non-wet cleanable fabric (excluding bonede and flock). 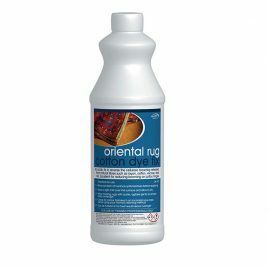 May be used on most carpets including silk and oriental rugs to prevent loss of sheen. 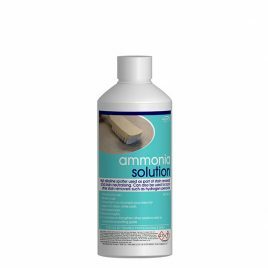 A high alkaline spotter to be used as part of the stain removal process to reverse or neutralise stain removal treatments, also used to speed up other spotting products. 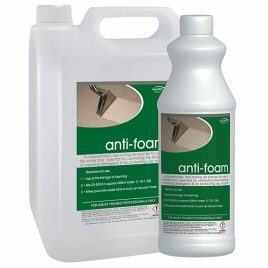 Anti Foam is a concentrated defoamer used in the waste tank to combat unwanted foam build-ups caused by residual shampoo left in the carpet. Essential costly damage to the vacuum motor. 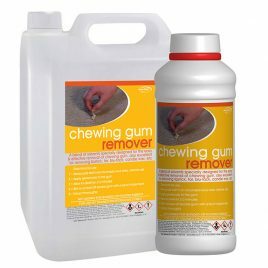 The most cost-effective way of removing chewing gum. This blend of solvents will not only dissolve gum but it is also excellent at removing lipstick, tar, plasticine, Blu tac, candle wax etc. 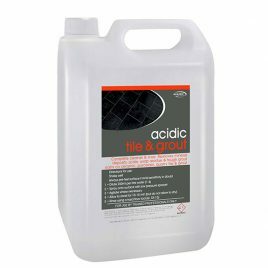 Not to be used on bitumen backed tiles. Always pre test area first. 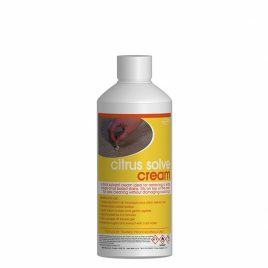 Solvent cream for the effective removal of oil based stains. 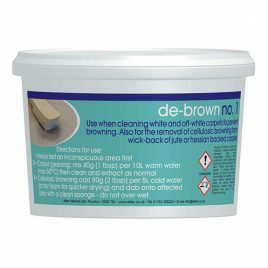 For use when cleaning white and off-white carpets to prevent browning. 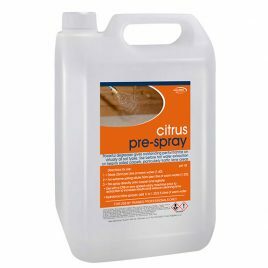 Also for the removal of cellulosic browning from wicking by jute or hessian backed carpets and tanning stains on light carpets. 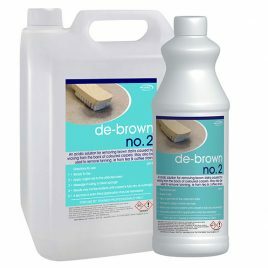 An acidic solution for removing browning stains from coloured (i.e. non white) carpets. A solvent-based agent for the removal of sticky/greasy substances such as oil, grease, tar, polish and some glues from carpet and upholstery. 100% safe on all materials (except bitumen backed carpet tiles etc). 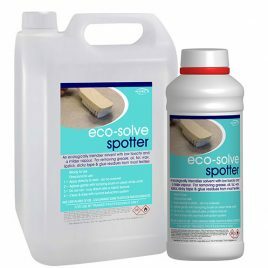 An ecologically friendly solvent spot & stain remover with low toxicity and milder vapour. For removing grease, oil, tar, wax, lipstick, sticky tape and glue residues. 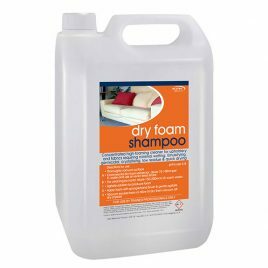 Suitable for use on most textiles and fibres. Comes in 5 pleasant fragrances: Cherry (Original), Delicate Apple, Fresh Linen, Warm Spice and Springtime. 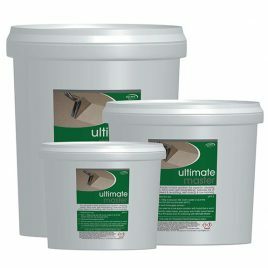 An in-tank anti-bactericidal and anti-fungal deodoriser for carpets and upholstery. 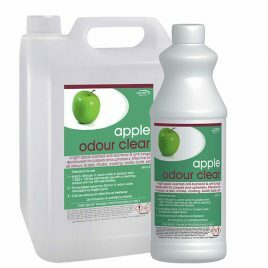 Effective in masking unpleasant odours from pets, smoke, cooking, flood damage and bodily fluids odours. 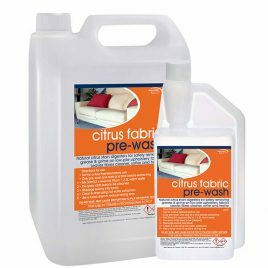 Ideal for use after cleaning or spotting to help remove the ‘wet sheep’ smell and very popular with customers as the sweet smell stays in the fabric for days, not just a few hours! 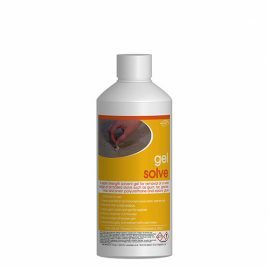 A powerful solvent gel ideal for the removal of a wide range of oil based stains such as chewing gum, tar, grease, candle wax, crayon and even polyurethane or epoxy glues. 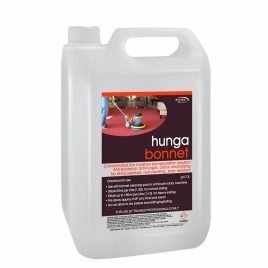 Hunga Bonnet (Encapsulation Solution) NEW! 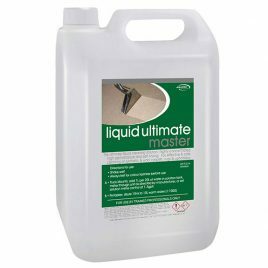 A special water-based blend of polymers and surfactants for fast and effective low-moisture cleaning of all wet cleanable carpets and carpet tiles. Efficiently captures and suspends soils when used with bonnet pads and soft brush rotary machines. 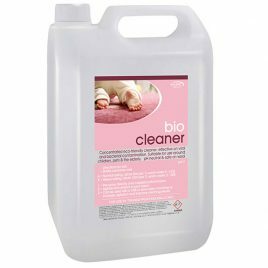 Anti-bacterial, anti-fungal and odour neutralising - leaves no sticky residue, is non-resoiling and offers excellent stain resistance allowing ease of future cleaning. 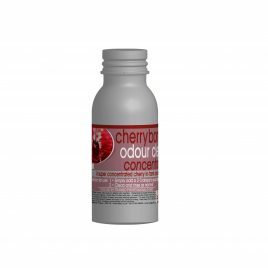 An oxidising agent to help lighten the shaded area that may be left after normal stain removal procedures. Hydrogen Peroxide may not remove the residual stain but works by slowly turning it colourless, thereby giving the appearance that it has been removed. 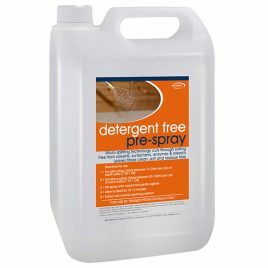 Extremely effective professional carpet and upholstery stain remover for stubborn water-based stains left by everyday spills from food and drink. Master Stain Remover is a near neutral pH product and is ideally suited for use on wool, synthetic and protected carpets. Use as the first attempt spotter to lubricate the stain and help release it from the fibres. 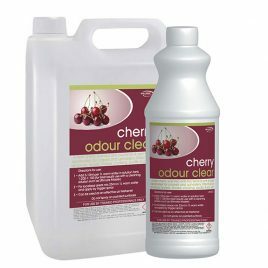 Very popular in office or domestic locations to spot clean carpets in-between deep cleans as it leaves no sticky residue. 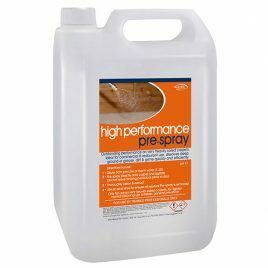 Only to be used on wet cleanable carpets and upholstery. 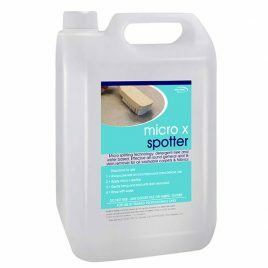 Micro X Spotter is a micro splitting spotter; detergent free, water based, all round spotter for wet cleanable carpets and fabrics. 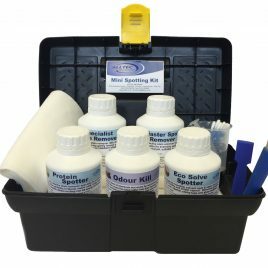 Handy mini spotting kit containing all your basic spot clean stain removers, all in a handy storage case for those smaller jobs!